The UFT's BRAVE campaign aims to combat bullying in our schools. Short for Building Respect, Acceptance and Voice through Education, the BRAVE campaign provides educators, parents and students with the tools, knowledge and support to be pro-active in confronting and stopping bullying. The BRAVE campaign provides an array of resources and tools for educators to make a positive difference in their schools. The union is offering a series of workshops for UFT members. There is online help available, from background information to lesson plans — see our Resources page. 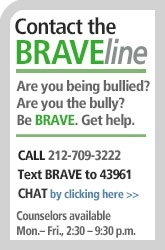 The BRAVE campaign also provides a hotline (212-709-3222, M-F 2:30-9:30 p.m.) for students. Students can also text BRAVE to 43961. We have buttons and bookmarks for UFT members to make the BRAVE campaign visible to students. Be a visible ally in your school. Wear a BRAVE button. Hand out BRAVE bookmarks to students. Hang a BRAVE flyer on your door. Ask your Chapter Leader how to get buttons and bookmarks. Download the flyer here: English version, Spanish version. Be vocal and intervene when you see bullying happening. Come to a workshop: contact the safety rep in your UFT borough office for information on the next workshop. (Parents: talk to your parent and community liaison.) Check out the online resources. Every child, regardless of ethnic background, gender identity, faith or immigration status, has the right to feel safe in our city and especially inside our schools. We come together to affirm that our schools are safe havens for learning and to demonstrate our commitment to our students and their families.